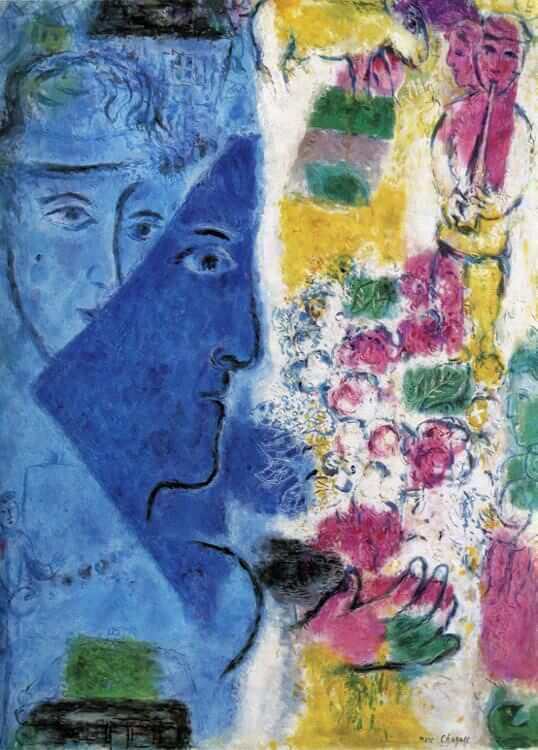 The Blue Face gives a cautious intimation of Chagall's new coloristic enterprise. It is developed from a purely abstract disposition of colors. Without thinking of any particular objective theme, the painter has prepared an attractively colored and harmoniously arranged ground, which serves as the playground for various poetic inventions. With a certain artistic pleasure in the difficulty involved in creating every symmetrical arrangement, he has divided the picture fairly accurately into two vertical halves. At the left he has set up a color zone of dreamy spiritual blue, and by modulating the tone values has given the effect of spatial movement without disturbing the surface. The clearly marked triangular form of deep blue defines the solid frontal plane, behind which is a flat, diffused graduation of planes caused by the distance effect of the light values. At the right, the surface is white and bright, with a variety of faint movements from the freely disposed color planes of earthen yellow, light pink, and bright green, which create a country-like, summery tone. This well-organized and quite abstractly structured colored ground is, so to speak, the bed of the picture, where many a play of associations may occur. On the left a face takes shape, looking across into the bucolic atmosphere of the multicolored zone, the hand already a part of the bright area. Behind the dark blue triangle is a woman's face and some little Russian huts in a dreamy blue light. In the lower left, however, the painter is at work, standing before his easel and looking across into the bright zone. It is the homely sphere of the painter's own dreams - his familiar surroundings, which he always likes to characterize by the image of his wife's face, his memories, his work - from which he looks at the world around him. What he sees there - or what he chooses to see at this time - is a tender dream of simple country life. This was a constantly recurring dream, which particularly haunted him in Greece. Above the shyly exploring hand rises a wonderful bouquet of country flowers. To the right stands a peasant woman carrying her child. At the top right, a young country lad plays his flute, and a girl teases a small yellow cow. There is an atmosphere of folklore and fable in these little scenes.